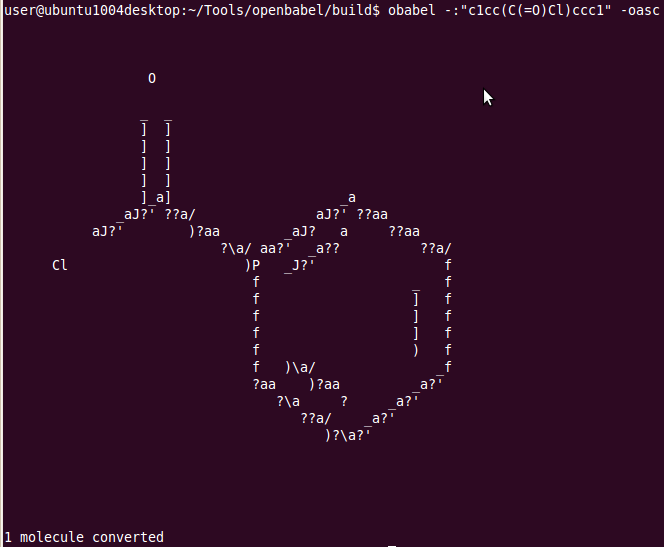 In an earlier post, I showed how PNGs depicting 2D molecular structures could be viewed in a text terminal. This can be useful when you're logged into a remote server and don't have access to a graphical viewer. Note that I haven't checked this code into SVN, and I'm not sure I will. For my own reference, I've stored some of the relevant files at this link (diff against r4530). Includes code taken from aa-helper. Avogadro has a plugin architecture that allows you to drop a Python script into a particular folder to add additional functionality, whether it be a new menu item, a new display method or whatever. 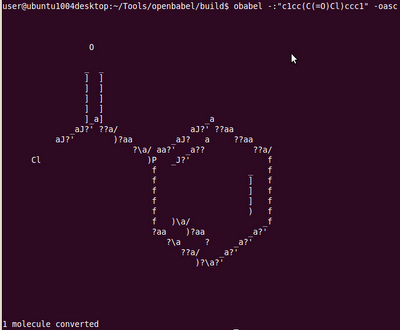 I've previously used this to write an extension to read comp chem log files using cclib. 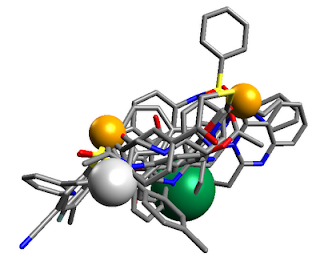 This time I need to add a new display method (or Engine in the lingo of Avogadro) that will depict a pharmacophore. So what's Pharmer? Well, until the release of Pharao by Silicos last year there were no open source pharmacophore programs. And the recent release of Pharmer by David Koes bumps the number up to two. Pharmer focuses on pharmacophore search - ultra-fast pharmacophore search, that is. It does this by precomputing an index that allows very efficient searching. The common denominator of Pharmer and Pharao is not only "Phar", but also that both use the Open Babel library. The file format used by Pharmer is simply JSON, which is easily edited by a text editor. 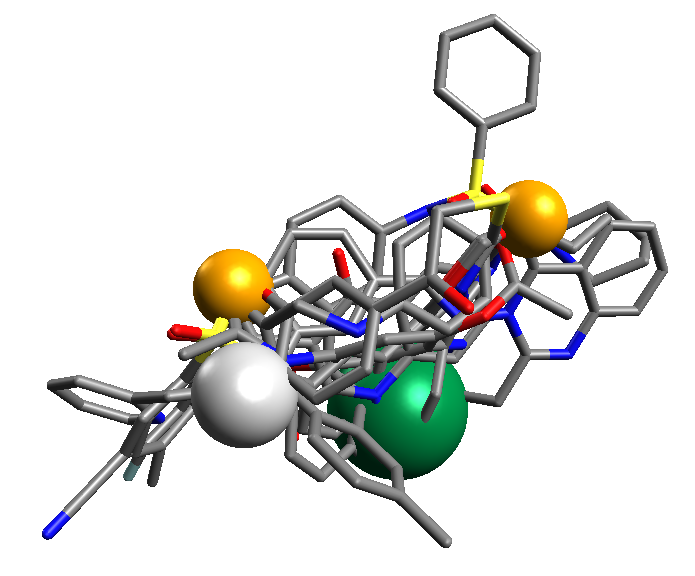 Here's an example that was created using the ZINC Pharmer interface: HSP90.txt. If you install Avogadro 1.0.1 with Python support on Windows, also have Python 2.6 installed in C:\Python26, and copy the Python script shown below to C:\Program Files (x86)\Avogadro\bin\engineScripts, then you can add the Pharmacophore engine (click "Add" in the "Display Types" panel; note: you can add more than one Pharmacophore engine if you want to display more than one pharmacophore at the same time). Once added, click on Settings and Browse to open the Pharmer JSON file. If nothing appears on the screen, try rotating the display slightly. In the previous post I described why it's useful to be able to generate SMILES strings starting and ending with particular atoms. This post describes how to do it. To begin with, one way to do this is using ring closure notation, as Rajarshi and Andrew pointed out in replies to a question of mine at the Blue Obelisk Q&A early this year. Andrew went on to write a Python script that allowed complete reordering of all of the atoms of a molecule using this method. I was hoping to find a more elegant method than using ring closures. Also, wholesale use of ring closures can cause problems with stereochemistry as this is a corner case that not all toolkits handle correctly. In any case, I kept thinking about this on and off, and eventually got around to trying some ideas out. In the end, the solution was easier than I'd thought. A SMILES string is generated from a depth-first tree traversal of a graph. Every atom (except for the root) has a parent atom, and 0 or more child atoms. Setting the start atom is trivial; just make that the root. It turns out that setting the end atom requires only two rules: (1) parenthesise all of the child trees of the end atom, and all but the last child trees of other atoms (this latter should be the default in any case), (2) visit child trees that do not have a route (through 'unvisited' atoms) to the end atom first. Note however that this may result in a SMILES string that does not accurately represent the original structure (but that's not the point of the exercise) e.g. What about the stereochemistry? Well, I toss that out too at the moment; an alternative would be to allow the user to specify the resulting stereochemistry at the start and end atoms. If you're still here, let me explain why. It allows you to take advantage of a really nice feature of SMILES strings: concatenating two SMILES strings allows you to easily generate new molecules. I call this (as of two minutes ago) Click Comp Chem or CCC (which of course is a SMILES string itself!). With Click Comp Chem, the first atom of the second SMILES string will become joined to the "last atom" of the first SMILES string. When I say "last atom", I mean the last atom not within parentheses (i.e. not on a branch), e.g. if I add an atom to "CC(I)(Cl)" by appending "Br" to the end, then the Br will be attached to the second C atom (not the Cl). CCC is particularly useful if generating polymers from a set of monomers (which is what we were doing in our solar cell paper), or generating a virtual library of combinatorial chemistry products (such as Jean-Claude Bradley did for his CombiUgi project, or as Duffy et al did to a create virtual library of peptides). As part of a project led by Dr. Geoffrey Hutchison (University of Pittsburgh), I have been collaborating on the development of a method to design so-called "molecular wires" (conducting organic polymers) for use in organic solar cells. Using a combination of computational chemistry and cheminformatics, we have been able to find organic polymers with the required electronic structure predicted to perform well as the electron donor in solar cells. N.M. O'Boyle, C.M. Campbell, G.R. Hutchison. J. Phys. Chem. C 2011. In press. Rather than repeat the abstract here, I'll summarise the general idea. Current solar cells are based on semiconductor technology and are expensive to make both in terms of materials and energy. Organic solar cells, while never going to be as efficient at converting light to electricity, offer the possibility of cheap solar energy due to the ease of manufacture and low cost of materials. In 2006, Scharber et al described how to calculate the efficiency of an organic solar cell based on the electronic structure (i.e. HOMO, LUMO) of the solar cell components, so the question was: could we find organic polymers with the required structure to maximise efficiency? To cut a long story short, we could. What we did was combine Open Babel/Pybel (for structure generation and forcefield optimisation), Gaussian09 (for ZINDO/S//PM6 calculations), cclib (for extracting the results) and a Python script implementing a genetic algorithm, and out popped molecular wires predicted to be highly efficient. The top candidates were then filtered according to additional criteria et voilà. 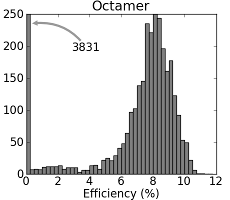 Overall, over 90,000 polymers were tested - still only a small fraction (about 4%) of what we'd have had to test without the genetic algorithm. If you're interested in a copy of the paper and don't have access to the journal, get in touch - we can distribute a number of copies through the ACS website.